This gorgeous little O from Collings will have you ditching that dreadnought (at least once in a while!) 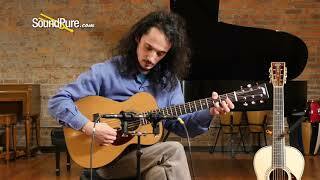 and enjoying the easy playability and tight response you get from such a small and articulate instrument. Baked Sitka top has a bit more openness than you'd get with a fresh piece of Sitka and the mahogany keeps everything tight and defined for a nice focused sound. If you're looking for a small travel guitar that has a TON of character or a songwriting guitar to keep close by at all times then give us a call about this incredible O1! 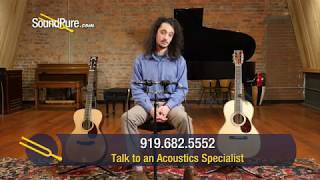 In this video, Sound Pure acoustic guitar specialist Barret Brooks compares 2 small body acoustics: a Collings 01 and a Martin 00-42 SC JM. In this video, Sound Pure acoustic guitar specialist Barret Brooks describes and demonstrates the Collings 01 Sitka/Mahogany Acoustic #27632. With the exception of the Baby, the 0 is our smallest guitar and is offered with the same shorter scale found on the 12-fret 00. Although measuring only 13.5 inches in width (smaller than a typical classical guitar), the Collings 0 has tone and volume that belies its first impression as being less than full-sized. It can double as a travel guitar or a small OM, performing both roles equally well. The same neck and woods options offered with larger Collings models are available on the 0 as well, giving players an almost infinite range of tonal possibilities. Bill Collings moved from Ohio to Houston, Texas in the mid-1970s. More interested in guitars and engineering than in his pre-med program, he took a job at a machine shop and began building guitars on his kitchen table with just a few hand tools. Coming from a family of engineers, Bill’s experience as a craftsman and his natural curiosity equipped him to experiment and quickly improve his craft. Before long his instruments were in the hands of local talents Rick Gordon and Lyle Lovett, which led more Texas players to seek out Bill for custom guitars. After building about fifty guitars and a few banjos in Houston, he headed west to pursue lutherie in southern California. While on a detour in Austin, he befriended Austin luthiers Tom Ellis and Mike Stevens. Having found like-minded instrument makers, Bill decided to stay and share space in Tom’s shop. By the mid-1980s, Bill was building flattop and archtop acoustic guitars in his own small shop. His reputation for outstanding quality and meticulous attention to detail quickly spread. In 1989, he rented a 1,000-square-foot space and hired two helpers. That same year, George Gruhn, the acclaimed collector and purveyor of vintage fretted instruments and owner of Gruhn Guitars in Nashville, asked Bill to make 24 custom “Gruhn” guitars, giving the Austin luthier national exposure. In the spring of 1992, Bill moved his guitar-making operation into a 3,200-square-foot feed store he purchased on the outskirts of Austin. Soon, musicians such as Pete Townshend, Joni Mitchell and Brian May were playing Collings instruments and demand continued to grow. The existing shop tripled in size and its staff increased to 50 full-time employees. By 2005, Bill broke ground for a new 27,000-square-foot shop featuring CNC technology that modernized machining processes and made parts production more consistent, accurate and safe. As the business grew and processes were refined, one thing remained the same: Bill Collings’ commitment to build the finest stringed instruments available. Fueled by his fascination with the construction and design of a variety of instruments, Bill soon began crafting more than just acoustic guitars. In 1999, he introduced the first Collings mandolins, which like his guitars, quickly set new standards for the industry. In 2006 his interest in carved top instruments led him to introduce a line of electric guitars that players quickly embraced because of the instruments’ exceptional craftsmanship and tone. In 2009, with a nod to the tradition of some other high-end acoustic guitar makers, Bill created a line of concert and tenor ukuleles that were hugely popular with professional and hobbyist players alike. Due to a sheer lack of “small shop bandwidth”, these were later discontinued after Collings started production of Waterloo Guitars, a stand-alone line of vintage-inspired guitars designed to capture the tone and character of some of the best depression era instruments. In that same “vintage” vein, in 2016, and after years of development, Collings began to sell their own acoustic guitar and mandolin cases, designed and fabricated in their Austin shop, built to match the quality of their instruments. Today, the mission is to continue Bill Collings’ legacy following his death from cancer in July 2017.